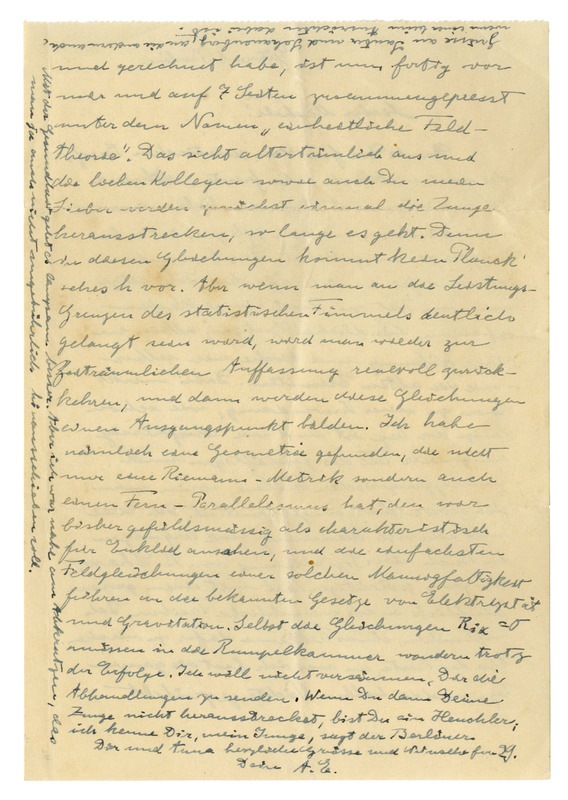 Exceptional autograph letter signed by Albert Einstein on completing his Unified Field Theory, in which he attempts to unify his Special Theory of Relativity with Gravitational Theory into a single theory in an almost spiritual way to explain the laws of physics. 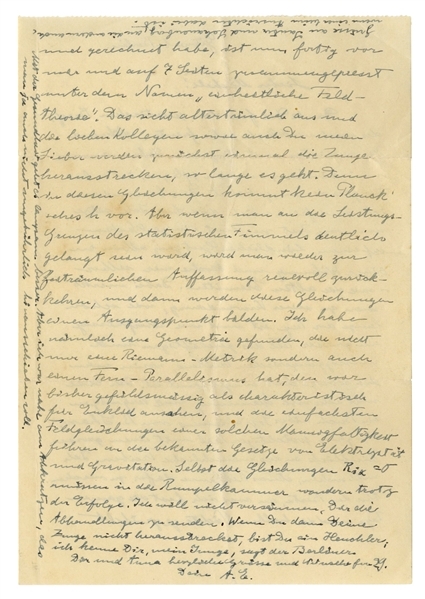 In his Nobel Prize speech from 1923, Einstein expounded on his belief of a singular theory that the universe must be operating under, a so-called ''Theory of Everything'' that has inspired Stephen Hawking and other prominent physicists: ''The intellect seeking after an integrated theory cannot rest content with the assumption that there exist two distinct fields totally independent of each other by their nature.'' 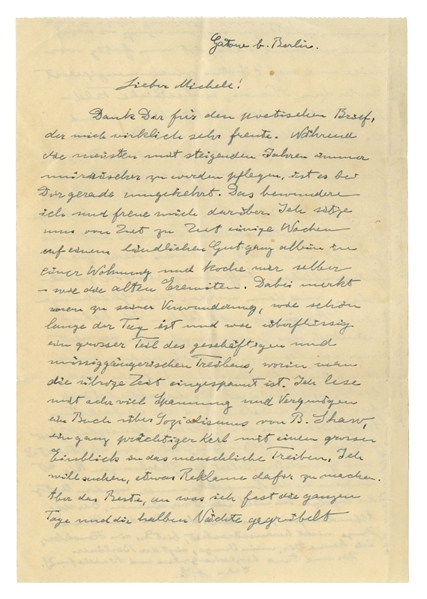 Einstein in fact, became somewhat preoccupied with the impulse to solve the unification puzzle, as evidenced in this letter, written to his closest friend Michele Besso, where he emerges from his solitude and ''brooding'' after finally completing what he calls his ''Unified Field Theory''. 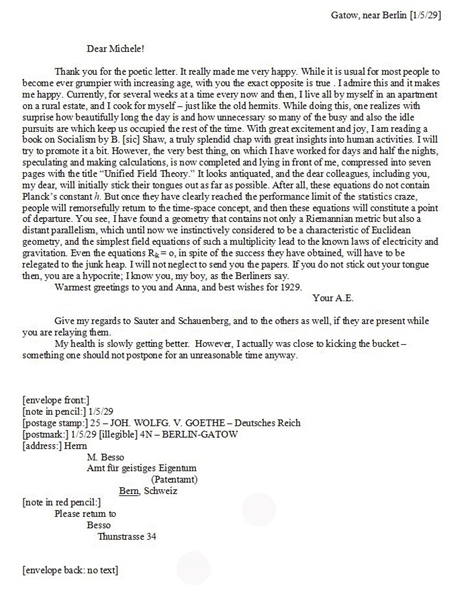 He mentions to Besso that he expects colleagues ''will initially stick their tongues out as far as possible'' because his ''equations do not contain Planck's constant h'' (the bedrock of quantum mechanics), which he infers is a ''craze'' and that he expects the physics community to ''remorsefully return to the time-space concept''. Indeed, though Einstein didn't dismiss quantum mechanics, he wasn't swept up in the 1920s furor over it, and believed it could be explained in a broader unification theory. 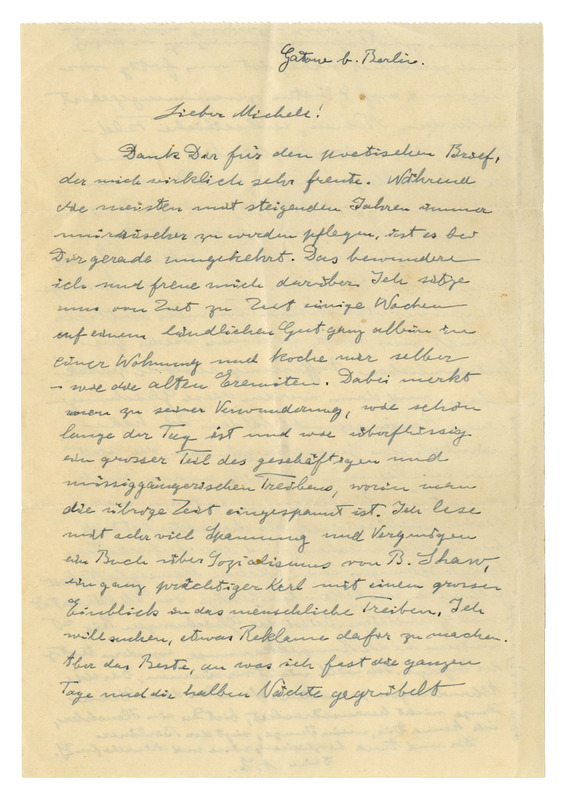 Fascinating letter was written from Gatow, Germany on 5 January 1929, translated from German in full, ''Dear Michele! / Thank you for the poetic letter. It really made me very happy. While it is usual for most people to become ever grumpier with increasing age, with you the exact opposite is true. I admire this and it makes me happy. Currently, for several weeks at a time every now and then, I live all by myself in an apartment on a rural estate, and I cook for myself - just like the old hermits. While doing this, one realizes with surprise how beautifully long the day is and how unnecessary so many of the busy and also the idle pursuits are which keep us occupied the rest of the time. With great excitement and joy, I am reading a book on Socialism by B. Shaw [likely ''The Intelligent Woman's Guide to Socialism and Capitalism''], a truly splendid chap with great insights into human activities. I will try to promote it a bit. However, the very best thing, on which I have worked for days and half the nights, speculating and making calculations, is now completed and lying in front of me, compressed into seven pages with the title 'Unified Field Theory.' It looks antiquated, and the dear colleagues, including you, my dear, will initially stick their tongues out as far as possible. 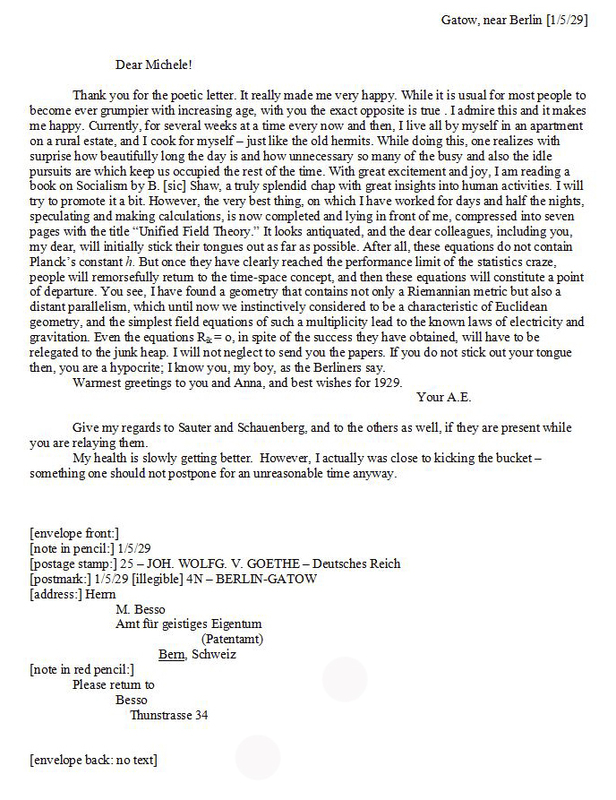 After all, these equations do not contain Planck's constant h. But once they have clearly reached the performance limit of the statistics craze, people will remorsefully return to the time-space concept, and then these equations will constitute a point of departure. You see, I have found a geometry that contains not only a Riemannian metric but also a distant parallelism, which until now we instinctively considered to be a characteristic of Euclidean geometry, and the simplest field equations of such a multiplicity lead to the known laws of electricity and gravitation. Even the equations Rik = o, in spite of the success they have obtained, will have to be relegated to the junk heap. I will not neglect to send you the papers. If you do not stick out your tongue then, you are a hypocrite; I know you, my boy, as the Berliners say. 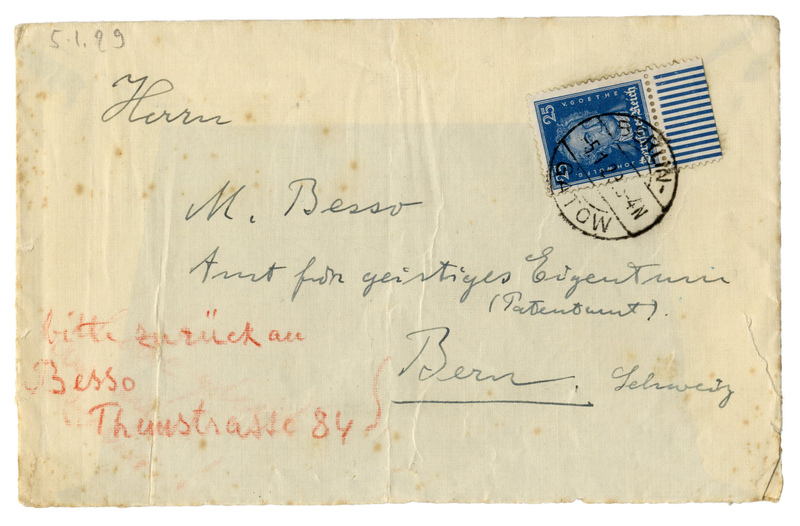 / Warmest greetings to you and Anna, and best wishes for 1929. / Your A.E. / Give my regards to Sauter and Schauenberg, and to the others as well, if they are present while you are relaying them. / My health is slowly getting better. However, I actually was close to kicking the bucket - something one should not postpone for an unreasonable time anyway.'' 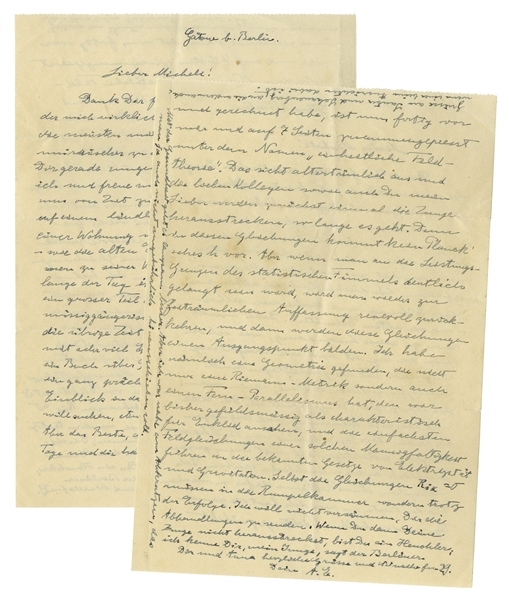 Einstein's theory was published later in 1929, pages 27-7 in ''Sitzungsberichte der Preussischen Akademie der Wissenschaften, Physikalisch-mathematische Klasse''. Letter on two pages of a 5.75'' x 8.25'' sheet is beautifully penned by Einstein in blue ink. With the original transmittal envelope measuring 6'' x 4''. In well-preserved, near fine condition. With complete translation.